This 45 minute Workshop Presentation will explore different classroom techniques for getting today’s young learners – so used to the internet and multimedia – into Extensive Reading. Considering the choice of text, and offering supportive pre-reading, while reading and post-reading activities will be covered in a practical ‘in nutshell’ way. 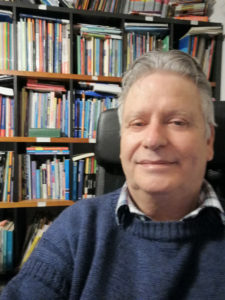 Bill Bowler is a freelance ELT author, and trainer, based in Alicante, Spain. He is passionately interested in Extensive Reading. Who is Bill Bowler? What is the single characteristic that you want most people to know about you? Bill Bowler is a trainer who takes the potentially complex and makes it simple and clear and (hopefully) fun! For me, the 5 Ts make a continuum which, in my presentation, link to extensive reading (ER). Out of Teaching experience comes Training expertise which, when Transferred to Teachers, can Transform personal practice. Transcend and Trust are elements over which a trainer (or a teacher) has no direct control. However, if the first part of the process has been smooth in my presentation, then I Trust that the methodology I share will Transcend the ‘nuts and bolts’ and become more than the sum of its parts. Techniques that work in practice are Trusted by Teachers! Transform is my favourite T. To share an idea which can have a transformative effect: it’s a bit like a cognitive relay race, passing the Olympic flame of understanding down a line of thoughtful runners. A breath of fresh air. This event, organised by TESOL Greece, will be my first time in Athens, and in Greece, too. After some months preparing for, undergoing and recovering from foot surgery, it will be good to be out in the world again. Happy birthday, TESOL Greece! Life begins at 40!